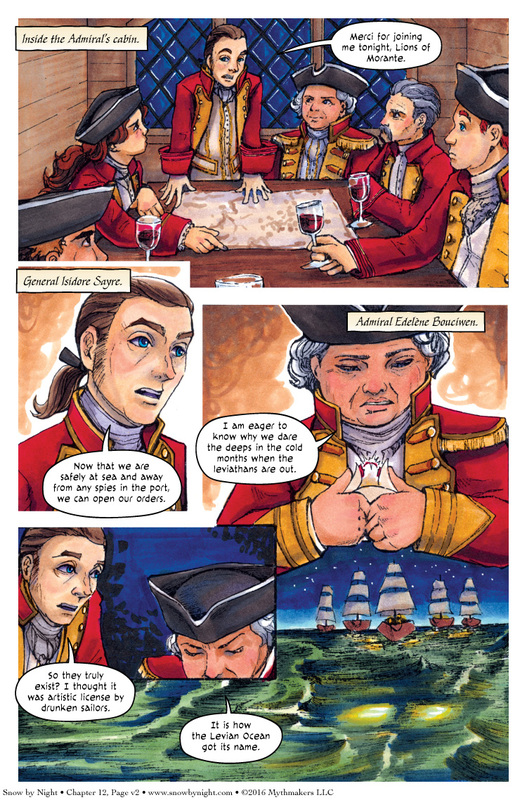 The Lions of Morante meet on Page 2 of Serpents in the Water. It was common practice in the navies of the Age of Sail to only open their orders when at sea. Ports were full of spies, and sailors were notoriously loose lipped. Vote for Snow by Night to see the target of the Morantine fleet. You can probably guess because of the story I’ve been telling so far, but confirmation is always good. It was nice knowing you guys! So is Morante like Burgundy and Saronne like France? Morante is roughly the equivalent of Normandy. Saronne is Aquitaine. Since England was conquered by the Normans, it’s a lot like Morante is England. So you are right. It does make more sense. Interestingly enough, at one time in the Middle Ages, the English king also held Normandy *and* Aquitaine. The Levian Ocean is named after leviathans. Well, that makes sense. …The chapter title being “Serpents in the Water” is probably a coincidence, and no one is going to be eaten by leviathans. Totally a coincidence. Or maybe a double meaning. I like those. I knew this flag on the last page looked familiar. Three golden lions on red ground, that was the coat of arms of Angevin England for a while (two lions for Normandy, another one for Aquitaine). I love how the water looks! If those lights belong to leviathans, I’m wondering if at least some of that red wine will end up on the map.